I have had this skin problem for over four years now. It does not seem to be getting any better. The skin rash only seems to be spreading. I have tried antifungal creams and a home remedy none of which helped or worked to clear my skin up. I do have acne but have had acne since I was 11 and I am 26 now so I know it is not an acne skin care problem. This skin rash problem does not itch or burn or cause any other types of bad symptoms. It is just there on my skin. I have the rash problem all over my body including my chest, my neck, both arms, and my groin region. I know that this skin problem is not jock itch and my closest guess was pityriasis rosea but I have no Herald Patch, at least I do not think I do. Sometimes when I get hot the patches are more red than when I am resting and cool. After I take a shower it seems as though my skin peels or flakes off, but only on the red rash part of my skin. The rash never bleeds or oozes anything from the affected areas. I just cannot figure what this skin rash problem is. I have uploaded some pictures of it so maybe you can see my skin rash problem and perhaps help me diagnose what this skin rash problem is. Thank you in advanced. Hi everyone. After years of dealing with this rash I found this blog. Someone mentioned Diflucan above so I went to my doctor and asked for that. Don’t laugh BUT this is available in a pill form over the counter. It is meant for a woman’s yeast infection problem BUT it did the trick! I was to take one right away and a second one a week later. By the second week my rash was almost gone! I wish I would have known this years ago. If you get this or have this, ask your doctor about taking these pills. It looks like Tinea Versicolor. If so, it is a yeast, which is a type of fungus. Many people get Tinea Versicolor. It can be very simply diagnosed in a dermatologist office. They do a small scraping and look at it under the microscope. My son has it and he was given a prescription. He was told told it would go away but when the medicine stopped it would come back and so he had to refill the prescription. He tried two to three rounds of treatment and each time it came back. Finally he stopped taking it. It is NOT contagious! I had the same thing. I went to the doctor and he prescribed me Diflucan. I took 1 pill for seven days and it almost all cleared up. I let him know I still had a little that did not go away and he gave me another five days worth of pills. At the end of the five days it was all gone. I have not had the rash come back but he did tell me it could possibly come back and if it did we would do the same treatment again. I have had this rash for years. I use mostly home remedies and I have found that coconut oil 2-3 times a day works great. Coconut oil has antifungal properties. Hope this helps! What makes candida rashes different than other skin rashes is that the source of the infection is usually a systemic candida and yeast overgrowth in the body. In other words, the rash is only one symptom of a much larger problem of excess yeast overgrowth in the body. This leads to many mistakes in the candidiasis of skin treatment, where the candida rash is treated topically, without considering the root cause of the candida overgrowth in the body. As a result, the candida rashes keep coming back and continue to spread. Common causes of candida overgrowth are antibiotics use or medication, diet high in sugars or processed foods, a weakened immune system and chronic stress. In other cases, there are less obvious causes such as food allergies you may not be aware of, heavy metal toxicity, chronic constipation and others. Hope this helps everybody. I am not a doctor so this is only my opinion. I have had this rash for 20 years as well. One of the readers had it right. It is caused by excessive yeast on the skin. Some people just produce more than others. Sweating makes it worse, that is why it is worse in the summer. It also makes a sun tan look crazy as the area infected does not tan correctly. My Doctor prescribes 1 pill a day for 5 days and it goes away for about a year. It can be cured by cutting out sugar in your diet after taking the medication. I will paste the info below. Ketoconazole is the medication and it is present in NIZORAL but only by 1%, so let your doctor know so you can get a prescription. I hope this helps everyone who is interested. That rash is a type of yeast that is coming from your sweat. The yeast loves people with a sugary diet. There are a lot of options for treatment, but the only way to get cured is to change your diet. It is hard to believe that the problem is coming from your gut, but it's true. I have had this for more than 10 years, and had to do a lot of research to be sure. It is candida - change your diet! I have had this rash for almost 15 years. I just figured that the Lotrimin antifungal spray or powder works like a miracle. The rash will disappear within three days of treatment. Just apply some powder one or two times a day and that is it. The bad news is, the rash will come back within a few weeks after stopping the treatment. I personally do not care anymore about having it because I am too lazy to keep tracking my body issues. Hey everyone. I have this same rash. It started off small and just seems to keep spreading, especially to places where my clothes rub. I can describe it as a giant pinkish brown blotch that is spreading across my torso with small spots, no itch, and no pain. It definitely gets redder when I am sweating or hot. I finally cracked and made an appointment with a dermatologist two weeks from now. If I get a diagnosis I will share with everyone. I have had the same rash everyone is describing. It is not raised, does not itch or hurt, and there is no discharge. I have had it for probably four years now. It gets better during the winter. It gets hot and pinkish/red when I exercise/sweat. Two dermatologists had no clue what it was and prescribed a cream, which I believe was a steroid cream that only made it worse. I started using selenium sulfide lotion, and I actually see some benefit but it is inconsistent and does not look like it will make it go away completely. After this lotion I will try cutting out gluten and see if that helps. It is only around my inner elbows, and I have accepted that it may be there forever but I am still going to try to get rid of it. My brother and I BOTH got this same condition 6-8 years ago and about a month apart. We do not know where we got it. We both use the selenium sulfide shampoos and more so in the summer. I find salt water really helps this go away. The first day of vacation is always spent swimming the the ocean. 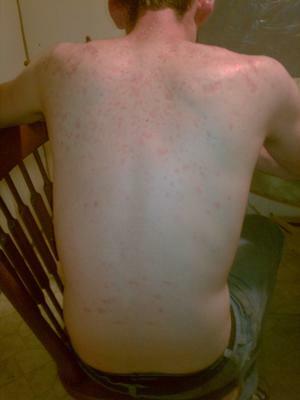 I have had the same rash all on my back since I was about 12 years old. It started after I swam at a lake. The doctor gave me cream for it, (super expensive and my insurance did not cover it). The rash faded away eventually then it came back a few months later. I am 18 now and I still have it. I treat it with dandruff shampoo and eczema cream. I feel uncomfortable and self conscious wearing a bathing suit and other clothing that makes it show. I shower every day and use the shampoo and cream. Also salt water helps but it never goes away. I have a visually identical rash and it does not itch or burn. It just looks bad. It would get worse if I skip a shower one day, and then get slightly better when I caught back up. But regardless of my hygiene routine, it would never go away fully. It made me too self concious to take off my shirt in public for a while, but one extremely hot day I wanted to go swimming at my apartment complex's pool. I layed out in the sun shirtless swimming here and there throughout the day and by the end of the evening the rash was way less noticeable. At first I though the pink glow from the sunburn had just camouflaged the rash, but the next morning it was totally gone. About once every couple of months it shows back up, in small mild patches at first then it spreads and looks more severe as the days go on, but another shirtless day under the sun clears it up again. I hope this helps some of you and gets you cleared up. Not Contagious! So, don't worry people to death! I have had this red, non-itchy rash since I was about 12-13, and I am now 23, almost 24. It usually occurs on my neck, back, shoulders, arms, chest, and sometimes the stomach. I have been to the doctor several times and cannot remember the name of this to save my life, but my treatments are all the same, dandruff shampoo, active ingredient being Selenium Sulfide (prescription or just buying at the store). Putting it on 15-20 minutes and then showering and making sure fresh, clean sheets and blankets are on my bed before I go to sleep, and it eventually will disappear. Only downside is that it does not stay away forever. Rarely, does it happen in the fall and winter, but when spring and summer roll around, it comes back. Sometimes worse than others. I have come to realization that it is something I have to live with and put a little bit more time in to taking care of my body than most people. It used to make me very uncomfortable, and I thought everyone was looking at me. The spots are my leopard prints. And hey, it makes me unique. One thing is for sure, ITS NOT CONTAGIOUS! And do not let anyone tell you different. If you are spreading it to other people, you do not have the same thing everyone else is talking about! Just wanted to add my information to this discussion. I have this and I use Head and Shoulders eucalyptus shampoo, but I use it as a body wash, particularly where the rash is and leave it on for a couple of minutes in the shower. Then after I use suave dry skin lotion on those areas as well. It has helped tremendously, but you have to do it everyday. I had the same red blotches on my upper arms, chest and neck. I read about a mite allergy. You know those little microscopic bugs that are everywhere. The article suggested making a loose paste of baking soda and hydrogen peroxide and dabbing it in the skin with a cotton ball. I tried this last winter and those red marks went away. I'm just now getting them again. So, give it a try. The article was actually about Rosacea. I seemed to pick up this rash a few months back. I've noticed the coloration starting to get more red after a shower or if I get hot. I went swimming in the Jordan river in Mississippi and a week later I noticed the weird shaped hives-rash. I also remember going for a run close to that time and got those sweat blisters that peel really easily. I am not sure if one thing had to do with the other. I just want to figure this thing out. I've had the same rash for about 25 years now. I had several doctors look at it but none were really interested as there was no pain or irritation. But one thought it looked like a food rash. My sister had a food rash as a child from eating plums, so I didn't discount it and over the years I've monitored it with what I eat. Recently, I gave up gluten for a year, because it bloats me, and I noticed that it completely disappeared. And now when I do eat bread it flares back up, more visibly now than before. So mine, at least, disappears when I cut gluten out of my diet. It doesn't disappear quickly, it was probably about two months without gluten before I happened to notice it had gone. (It could have gone quicker, I'd not been watching). This is not a fungus if you got it from swimming. I got it when I was 13 and now I am 40. It's still here and will always be. My doctor knew once what it was but he is now gone. I had to use a very expensive cream. It was 40 dollars that many years ago. I can't find any doctor today that knows anything about it. I do know that antifungal cream will make it grow. I Have Had This For Over 30 Years! Mine began after swimming in a cove of lake Pontchartrain around 1981-82 and thought that it might be a fungus. It becomes unnoticeable for months, usually in the winter months. It has come back with a vengeance this early summer. Our region has been much more humid than usual and the rash popped back after I was doing a lot of sweaty, outdoor home work. This is an old pattern for me - heat and moisture causing a flair up. I am hoping to finally get to a specialist and solve the mystery - if not the chronic, sporadic events. I have found some mitigation from bathing with 'Fungi Cure' by Alva-Amco Pharmacol Cos Inc. which contains Tea Tree Oil. I have the same rash. I tried changing deodorant, soap, lotion, etc., and using cortisone cream. Nothing has worked. It is under and around my breasts, armpits, around my ribcage (both sides) on my abdomen and now my thigh. My doctor first thought it was just dermatitis and said to try cortisone cream, which I tried again. She then said to try this Nystatin powder. Yesterday she prescribed Ketoconazole cream 2% for round worm only it's not round anywhere except two patches. I am sure this new medicine will not work and after reading all of your posts even more sure. I am 55 and have had this for around 10 months. Please post if any of you find something that works. Any update on what this is? I believe I have it as well. I am 31 years old and I have had for years. Any cures? Has Anyone Figured This Rash Out? I'm a 26 year old female and I think I have started to get this rash. It started as a small spot on my neck and within the last month and has gotten slightly worse, spreading around the back of my neck and down the front of my shoulders. It doesn't itch or hurt or bother me in anyway, other than it just being there. I am starting to get nervous that it won't just go away on its own. I have tried some over the counter creams and nothing seems to help. Please, if anyone knows something, help a girl out! I have had this same rash since high school. I contracted it from a sun chair by the pool when I was visiting Hawaii. It is a fungus and you can spread it to other people. It does not cause any real harm. Regular dandruff shampoo is what you are normally told to use or a fungus cream for athlete's foot. Neither have worked for me except a prescription dandruff shampoo that you must follow the directions perfectly. Please know that for a time it will go away but it will eventually come back. The hotter the summer and the more you sweat the easier it comes back. Also if your spouse has it like mine it is hard to get rid of it because you might pass it back and forth to each other. If you are pregnant please do not use the fungal cream which can be unsafe on your skin. Good luck! I am a 38 year old woman that has had this rash since I was in my 20s. It can be spread to others, but it is not harmful. My ex-husband contracted it from me and the doctor told him the name of the rash (which I can't remember, because it was a long medical term). The doctor told him that they don't know what causes it, but that it can be treated with dandruff shampoo left on the skin and then rinsed off. The first treatment should be left on for at least 20 minutes and five minutes for all other treatments. This does work, excepted it is not a cure. You have to continue treatment or the rash will return. I wish I could give you more information, but the doctor said because this rash doesn't cause any medical issues there is not that much information on it. Good Luck. I hope this will help. I have a rash that is similar in appearance to that in the picture at the beginning of the page. It started about two months ago on the inside of my left forearm. At first it looked like the onset of ringworm, but it didn't itch. Since it didn't bother me, except its appearance, I ignored it. Well, it began to spread on that forearm, lower down and to my right inner forearm. I finally went to my primary care physician. There, one of his nurse practictioners prescribed an ointment, Clotrimazole and Betamethasone Dipropionate cream. I have been using it for a week, and it hasn't helped. In fact the rash is spreading. I will have to go to a dermatologist, but I have a suspicion that it isn't primarily a skin problem, but a symptom of an underlying problem. I notice that of those giving their age here, I am the oldest at 67. To the fellow with the agent orange question, my dad was a chemist in Vietnam making napalm and dropping agent orange from planes. Good theory and maybe you should do some more research on that. The only thing that will tell for sure what kind of rash this is will be to do a biopsy or culture. I can't afford one nor can I find a doctor who doesn't think he already knows. I have heard so many times it is just Versicolor but then why do I still have it. I want to go outside with my shirt off and I can't. We need a cure. Hi I am a 14 year old girl and I have the same rash. My parents have not taken me to the doctor yet but the rash is spreading around my back and up my neck and I have two spots on my face. 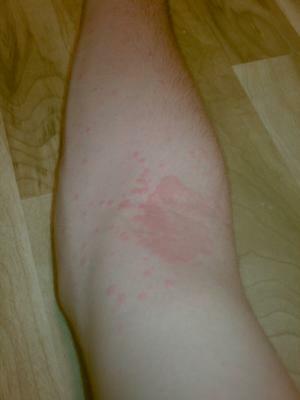 I anm really scared of what this could be and hope when I go to the doctor that they find a diagnosis for the rash. I will let you know if they do. It started as a spot right between my breasts and has spread all over my torso and back and now has gone up and neck and onto my face. I have the same skin rash and nothing makes it go away. My dad was in Vietnam and I am thinking it is from the Agent Orange. Please send me something back. I have that rash in the same spots, scary. I have had the same rash for years. It seems to come and go almost with the seasons changing. As I am in upstate New York, the weather gets very hot and very cold. Just out of curiosity, does anyone have a father who may have been in Vietnam and came in contact with agent orange in any way. I am just trying to rule out that it could somehow be genetically passed on from my father who was in contact with this substance which I do not know a whole lot about. I am a 26 year old male that has been dealing with the exact same thing for the past four or five years. I too have tried to ignore it, using an anti-fungal spray here and there to see if the rash subsides. Nonetheless, it seems to have become more pronounced on my back and moving more towards my abdomen and torso region. I am making an appointment with the dermatologist this week but, out of curiosity, have you found any answers? I have had problems with psoriasis on my scalp in the past and get contact dermatitis every time I wear a belt with a metal buckle (it would seem my skin is cursed lol). I had initially thought it was from my underarmor, but have since replaced the article for a new one with no significant changes to the pattern of the rash. If you, or anyone for that matter, have found anything out about this peculiar skin problem please let me know. I will post after having met with my dermatologist. I have the same rash at the same locations. It turns white sometimes and peels sometimes. It has been itchy lately and I can't use just any lotion on it. Two doctors have told me it is eczema and one said it was eczema but didn't rule out chronic hives due to stress or underlying liver problems manifesting into a skin issue. Apparently, your skin shows signs of liver problems. I have found relief in sesame oil and Curel intensive cream but I have to deal with the fact that this rash is part of my life. It could be a lot worse. Good luck. I have had this same rash for a couple of years as well and done all the doctor's recommendations including steroid creams. The only thing that makes mine go away for a while or as long as I'm using it is equate triple antibiotic. I assume its the zinc but can't be for sure. Anyways if you find out what it is shoot me some info via this thread. I went to a doctor who told me my rash was a fungal infection and prescribed me Fluconazole 100mg once a day for seven days. I just got the medication and haven't started it yet. Once I start taking the medicine I will take daily pictures of the progress and if it works you guys might want to ask your doctors about it. No word on exactly what it is other than fungal at this point. I'm a female from Michigan and I have the same thing. It is on my neck, chest, arms, back, and there is a small patch just below my belly button. This rash came about when I was 17 and I'm now 23. It started just at my neck and chest and has spread since. The first doctor I saw prescribed some hydrocortizone cream but it didn't help. I tried ignoring it at times and pretended it didn't exist, but that never lasted long. I think I could deal with not having a cure, but not knowing what it is is really starting to get to me. I know this comment probably isn't uplifting or helpful in any way, but at least you know you're not alone. Hey, James! My name is Michael and I have the exact same problem. I am 29 and I have the rash on my back, upper chest, inner arm around the elbow, and my back. It does not itch, burn, or anything like that. I have tried antifungal creams and selenium sulfide to no effect. I have a dermatologist appointment next month. Have you figured out what your rash is yet? Thanks! I have the same problem. I thought it was pityriasis rosea but I also have no Herald Patch plus they never go away! I had to put antibiotic cream in my nose to treat a mild staff infection and guess what, after three years the rash started going away. Not sure if it will come back but it is worth a try.